Back in guiding mode after a short break, and my week seems fairly divided between tours of parliament and work for London Walks. I had a bit of free time in parliament today, so headed outside to leaflet passers by. Some people ignore you, others smile and shake their heads, some walk by and then come back, quite a few take a leaflet and ask questions. It was encouraging back inside to see some of them enjoying tours. Parliament doesn’t make any money from the tours. The charge – £16.50, and £14.00 concessions – covers the costs of administration, guides fees, security and so on. Nor is parliament allowed to advertise the tours in listing magazines or with, say, a banner. Most visitors come because they know someone else who has visited and enjoyed it. Therefore the leafleting job is quite important for raising awareness. It can also be a nice way of meeting people. The MPs may be on their summer hols, but that doesn’t mean the Palace of Westminster is quiet. The summer opening brings visitors from all around the globe. This Saturday I shall be one of the Blue Badge Guides taking groups on guided tours of the building, following the Line of Route from the Victoria Tower through the Lords and the Commons and ending in Westminster Hall. Parliament is an impressive building inside and out. The Speaker has apartments in the clock tower. 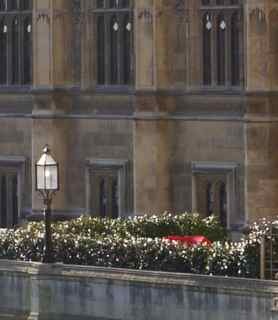 The current Speaker has a young family, and from Westminster Bridge you can just see a glimpse of the children’s playhouse in the garden.